Here is everything you need to know about taking cannabis tinctures, including a recipe. Are you wondering if a cannabis tincture is for you? Or are you scouring the internet, looking to upgrade your weed tincture medicating skills? 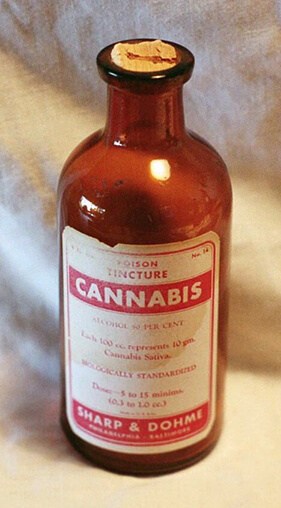 Figure 1: A cannabis tincture bottle from the early 1900’s from the Pharmaceutical company Merck and Co.
Weed tinctures are liquid extracts of cannabis’ main therapeutic actors – cannabinoids, terpenoids and flavonoids – that are usually stored in bottles with droppers or sprays. And they’re typically made through steeping dry cannabis flower with consumable solvents, like ethanol and certain oils, for at least 6 weeks. While steeping jars for at least 6 weeks, edible-friendly solvents like ethanol or glycerin breaks down the flower’s cell walls, allowing its MANY valuable compounds to be released and stored into the finished liquid oily substance. After the steeping process is finished, the liquid extract is strained and then packed into bottles for use. If you’re interested in greater detail of a how to make cannabis tincture recipe, carry on to the last section. What’s the Deal with CBD and THC Ratios? In weed tinctures, cannabis’ many valuable compounds are measured in CBD and THC ratios, such as 20 to 1, 8 to 1 and so forth. This conveys that a specific tincture holds 20 times the amount of CBD over THC, like how a dry flower strain would have a 20% CBD and 1% THC content profile, such as the AC/DC strain does. You’re probably wondering – why are cannabis compounds measured in ratios? The short answer is because of the “entourage effect”. The entourage effect is a term coined by scientists that conveys cannabis’ greater power in tackling certain conditions when its HUNDREDS of molecules are mixed and matched together in different proportions. So in other words, ratios are used because of the entourage effect’s medical efficacy, ultimately, providing connoisseurs and patients a guideline of what best tincture to select for their specific needs. 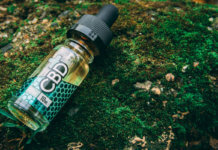 In addition, the use of ratios is supported by the first ever FDA approved cannabis pharmaceutical drug Sativex, which was approved in 2006 and holds a CBD and THC ratio of 1 to 1. 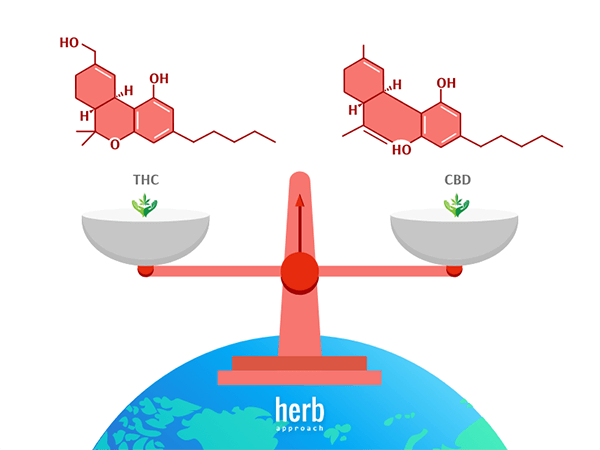 How are CBD and THC Ratios Created? 1. Through matching the same proportion of isolate products with a solvent of choice. For instance, if the end tincture desired holds a 1 to 1 ratio, this method entails of taking identical amounts of THC and CBD isolates in oil form, and then mixing them with glycerin (or another solvent) to make the finished tincture. 2. Through taking a cannabis strain with the exact ratio and using it in the steeping process. In this method, if the desired tincture ratio is 1 to 1, the manufacturer would take a 1 to 1 strain and put it through the steeping process. For instance, AC/DC and Harlequin strains hold ratios of around 20 to 1 and 5 to 2. If they were used in the steeping process, this would further translate into the same ratios for their refined tinctures. 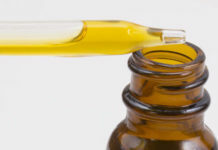 There are a handful of reasons why cannabis tinctures are used over other cannabis products, like edibles, dry flowers, various concentrates and topicals. Here are the most important. Figure 2: Health benefits aside, cannabis tinctures are widely used because they also have many practical benefits. Some are its short onset time and long preservation life. Since cannabis tinctures can be consumed sublingually – meaning they can be either sprayed or dropped under the tongue – they have the advantage of having a short time to onset (time duration to feel effects). Especially when compared to marijuana edibles. How fast you might ask? Anywhere from 15 minutes to 1 hour, generally speaking that is. As for eating marijuana edibles, you can expect to wait anywhere from 1 to 3 hours to feel the effects, depending on a lot of factors, like weight, diet, tolerance, and metabolism, of course. The fast onset of cannabis tinctures is all because of biology. Simply, by placing or spraying cannabis tinctures under your tongue, the compounds directly enter your bloodstream, instead of having to go through your liver and digestive systems. Dosing is major advantage when it comes to cannabis tinctures. With each 1 ml drop, or measured spray, you’re able to better measure your optimal dose. This proves to be crucial, because finding the optimal dose is a tricky, tricky process that can require constant adjusting day and night. Which is almost impossible with pot edibles, given the challenges of decarboxylation and other processes related to cooking. For an even easier dosing experience, we recommend you use Full Spectrum CBD tinctures. Here’s why . Another advantage cannabis tinctures have over other products is its LONG shelf life. Long as in a handful of years, at the least. Important to Note: A cannabis tincture’s exact shelf life depends on what additives and ingredients are used. Not only does it have a long life-span, but tinctures can also be preserved in environments both cold and room-like in temperature. But, if you’re storing for much later use, a cool location away from direct light and heat is recommended. And if you’re wondering as to how tinctures have a long shelf life – think of alcohol, the great bacteria fighting solvent. Lastly, cannabis tinctures have these practical benefits of faster onset times, easier measuring of doses and a longer shelf life with NO compromise to its potency and experience duration. So in other words, you can expect your experience to last 4-6 hours, which is identical to eating pot edibles. There are a number of ways of how to use cannabis tinctures, whether they be CBD or THC isolates, or of the Full Spectrum CBD variety. Here are the most effective ways. Figure 3: There are three main ways cannabis tinctures can be used: spraying, dropping and as an ingredient for food. If you choose this method, place a drop of CBD under your tongue so that it’s absorbed in the mucus membranes. Hold it for 60 to 90 seconds before swallowing. It’s important that you DON’T place a drop on top of your tongue, otherwise, you’ll be swallowing it, which is the ingestion method. If you proceed this way, the onset time can increase to around 2 hours. Before you consume a weed tincture by spraying it in your mouth, first practice spraying it onto a piece of tissue. Once you’re comfortable, place the nozzle into your mouth, either inside your cheek or under your tongue, and then press it. Make sure you let your mouth absorb the contents for a minute. To avoid irritation, it’s best to spray in different areas of your mouth each time! If you prefer to eat a nutritious and delicious meal or have a tasty drink, place a few drops or sprays onto the finished entree or beverage. Need ideas? Try placing a drop onto sauces, salad dressing, smoothies, juices, soups or desserts. Don’t be afraid to get creative and fun with it! Regardless of which weed tincture product you have, one rule is to apply the age-old phrase, “start low and go slow”. That’s not very scientific, I know. But when it comes to the right cannabis tincture dosage, things get a bit tricky as there’s no “one size fits all” approach. Figure 4: Finding the right cannabis tincture dosage is not an easy task. It’s recommended to start small and work your way up. The reason behind this is because the “right dose” depends on factors like body weight, diet, stress levels, metabolism, tolerance and the symptoms being addressed. Just to name a few. In addition, cannabis’ compounds follow a confined dosage window, meaning, its medical power is only unlocked above a minimum dose and below a maximum dose. And if this maximum dose is crossed, the medical benefits of cannabis shows to decrease dramatically, while its adverse effects do the complete opposite. So in other words, if you don’t take enough or if you take too much, you’re likely not going to experience any symptom relief – at the least. NOTE: As mentioned above, if this is a stubborn issue, we recommend using Full Spectrum CBD as a replacement. If you’ve never used cannabis tinctures before, start with a 1.25 to 2.5 mg dose before bedtime for two days. If it’s not doing the trick, increase the dose to another 1.25 to 2.5 mg for two days, doing so until you see relief and have no UNWANTED side effects. 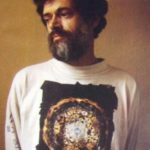 If the beginning experience proves to be strong and/or if side effects occur, do the opposite and decrease the dose for two days until you’re comfortable. Note: If you’re interested in making CBD oil tinctures instead, here’s 2 recipes – one for full spectrum CBD and CBD isolate tinctures. Making herbal tinctures is a ritual dating back thousands of years. 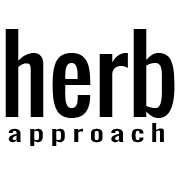 With cannabis, creating your own herbal tonic abides by the same process as other herbs, where the most popular use everclear alcohol, vegetable glycerine, olive oil or MCT oil. Figure 5: Making cannabis tinctures is extremely easy. Many use Everclear acohol because of it’s high alcohol content, making it an ideal tool in extracting compounds. 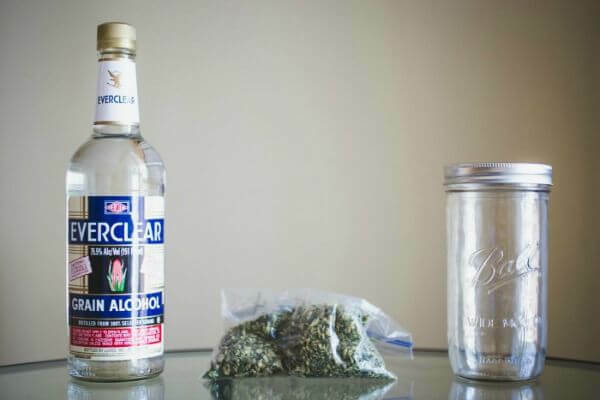 Here’s a basic cannabis tincture recipe that’s extremely easy to make. The first 3 steps have to do with decarbing your cannabis. If you’re familiar with this already, skip to step 4. Preheat your oven to 230 degrees Fahrenheit and then line your oven tray with aluminum foil. 2. Crumble, break up or grind up your cannabis into small pieces and place on the tray. At least an 1/8 ounce is recommended. 3. Bake the cannabis for 110 minutes to convert create the decarboxylation reaction – this means the THCA is being activated and turned into THC (which gets you high!). 4. Put the cannabis in a mason jar or something similar. Pour your drinkable alcohol into the jar to cover the cannabis. 5. Close the jar with a tight-fitting lid and shake it thoroughly. 6. Store the jar in a warm and dark place for 1 month (minimum) as darkness prevents the THC from degrading. Shake the jar every day for at least 2 weeks. The longer you store it the better to get a stronger taste – try to store it for 8 to 10 weeks ideally. 7. Once the appropriate time has passed, strain the leaves out with a coffee filter. 8. Store your finished cannabis tincture in a container. Make sure to keep it far from heat or light sources to preserve it. 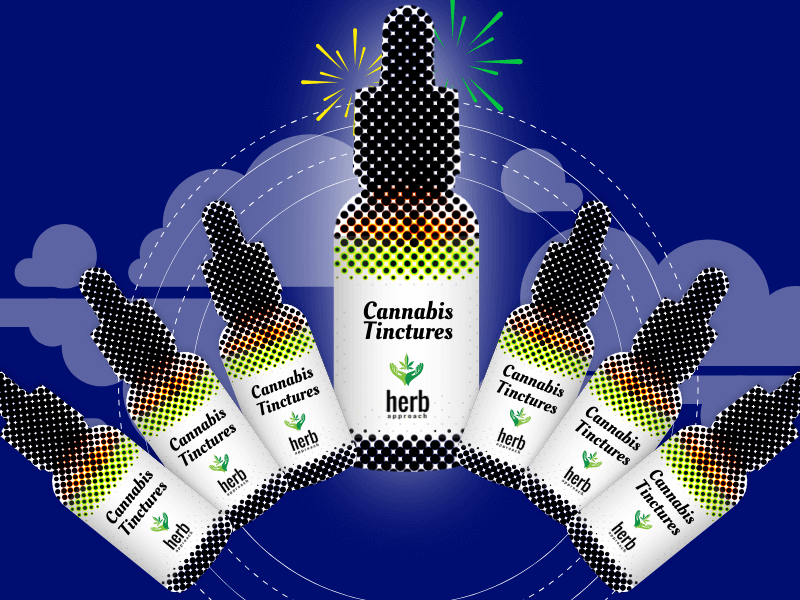 Weed tinctures are just one of the MANY ways to experience cannabis’ healing properties. They’ve soared in popularity because of its fast onset times, easier dosing measurements and sustained potency. With this guide of everything cannabis tincture related, you’re sure to make the most of your experience.